View of Marine Drive at Fisherman's Cove. Boats moored in cove in background. View of Marine Drive along edge of Fishermans Cove. Single tree can be seen on right hand side between road and water. 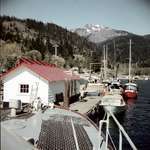 View of Fisherman's Cove and Passage Island. View looking northeast along Marine Drive in Fishermans Cove. 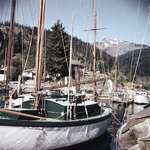 Boats moored on wharves along shoreline.